Read more about this exhibit in Columbus Alive. The Sewer’s Art: Quality, Fashion and Economy features 49 beautifully constructed garments that reflect the creative and artistic talents of four fashion and style-conscious women from the beginning to the end of the 20th century who sewed for economical reasons and/or for self expression, to create high quality fashionable clothing. Home sewn clothing is rarely, if ever, exhibited in a museum. It is not considered ‘art’ in the academic sense. Art museums primarily showcase the work of ‘professional’ artists, and the clothing most often exhibited in art museums is of the ‘fashion designer’ variety. Museums mostly ignore clothing that was sewn at home. It does not have the value given to ‘high’ art (painting and sculpture) that some designer fashions also have. In fact it is mostly anonymous, created by women who are or were, predominantly homemakers, who created their or their children’s clothing mostly out of economic necessity, but often also out of a desire to express themselves creatively. “Home-sewn” and “home-made” have become pejorative terms, generally associated with crafts of low quality. This does a great disservice, to those with high levels of skill and creative ability who produce beautiful clothing at home that rivals that produced professionally by fashion designers. The garments produced by the home sewers featured in this exhibition combine the same elements implemented by the fashion designer: fashionable style with quality materials plus creative inspiration. In spite of a frequent need to economize, home sewers often do more than merely copy a picture on a pattern. They exercise their creativity by choosing fabrics and trims and by combining or altering paper patterns to achieve the desired look. This creativity is The Sewer’s Art. The inspiration for this exhibition began with a visit from Susan Beall in 1997-98. At that time, she informed us that she had sewn most of her clothing throughout her lifetime, beginning before her graduation from OSU’s School of Home Economics in 1949. Susan also informed us that she had kept a record of her sewing projects, including her inspirations, which patterns she used, swatches of the fabric she used and how much it cost, and subsequent alterations to the clothing. When she told us this, we immediately thought of Barbara Johnson’s Album of Styles and Fabrics. Barbara Johnson was an 18th century lady who kept a record of fabrics used to make her clothing and how much the fabric cost, as well as contemporary illustrations of fashionable dress. Barbara Johnson’s album spans the years 1746-1823 and is in the collections of the Victoria and Albert Museum in London, but is too fragile for handling. A facsimile of the album was published in 1987, retailing for $100. We mentioned Barbara’s album to Susan Beall, and remarked that her records were a 20th century version of the Barbara Johnson book, with one difference. Susan made her own wardrobe, whereas Barbara depended on dressmakers for hers. Susan took that comment to heart, and proceeded to further organize and document her materials. She presented an installment collection of her exquisitely sewn wardrobe with her own album and swatches in 1999, followed by more garments in 2003. From our first encounter we thought, here is an exhibition idea. Both the Barbara Johnson book and Susan Beall’s album are featured in the exhibition, Susan’s album as a Powerpoint presentation. Since 1999, the Historic Costume & Textiles Collection received additional donations of garments that were sewn by their wearers, but none that rival the quality of workmanship and style paired with an interesting life story such as the selections chosen for this exhibition. In addition to Susan Beall’s impressive collection are garments made and worn by Dr. Ruth Ella Moore, Mary Heck, and Dr. Joyce Smith. Ruth Moore received her BS in Chemistry from OSU in 1925, and followed that up with an MS in bacteriology in 1927. After three years teaching at Tennessee State College, she returned to OSU and pursued her Ph.D. in Bacteriology which she received in 1933 — the first African American woman to do so. She had an illustrious career in higher education, teaching and serving as Chair of the Department of Bacteriology at Howard University from 1948-58. Given all that responsibility, she somehow found the time to make many of her own clothes — from quality fabrics, with quality construction, and without any formal training. Sewing garments in the home has a long history — one based in the necessity to clothe the members of the family and provide the household linens. Before the industrial revolution, the invention of the sewing machine, and mass produced clothing, women were responsible for making their own clothes, including underclothing and night clothing, as well as all of the children’s clothing, and shirts, underwear, and nightwear for the men of the household. The task of providing clothing for the family, as well as making the necessary household textiles such as towels, pillowcases and sheets, was a never-ending task. Even with the arrival of the sewing machine, the work did not necessarily decrease; the sewing machine saved time and money but not labor. Many women worked as seamstresses or dressmakers in the 19th century, either at a place of employment, or as was often the case, piecework was done in the home to provide extra income. Columbus even had a dressmaking school located downtown on High Street in the 1890s. Women who married brought these skills into their households. Mary Heck, another featured artist in our exhibition, was such a person. She worked in a tailor’s shop before marriage, but afterwards, made her and her daughter Grace’s clothing. Two of Mary’s dresses and two dresses she made for Grace dating from 1895-1911 are featured in the exhibition, along with Mary’s treadle sewing machine. One of Mary’s dresses is referred to as an ‘artistic’ dress. Sewing was very much a part of a woman’s education during the 19th century, and land-grant colleges created toward the end of that century continued this tradition by offering courses (for women) in the “domestic sciences,” including sewing. In 1914, the Smith Lever Act established the Cooperative Extension Service to spread knowledge from the land grant colleges to the citizens of the states via educational programs developed by extension agents. Sewing education is represented in the exhibition via ‘how-to’ manuals, including several written by Mary Brooks Picken for the Women’s Institute of Domestic Arts & Sciences series, a child’s toy Singer sewing machine, and two 4H projects created by Christine Kibler Dambach in 1926 and 1932. 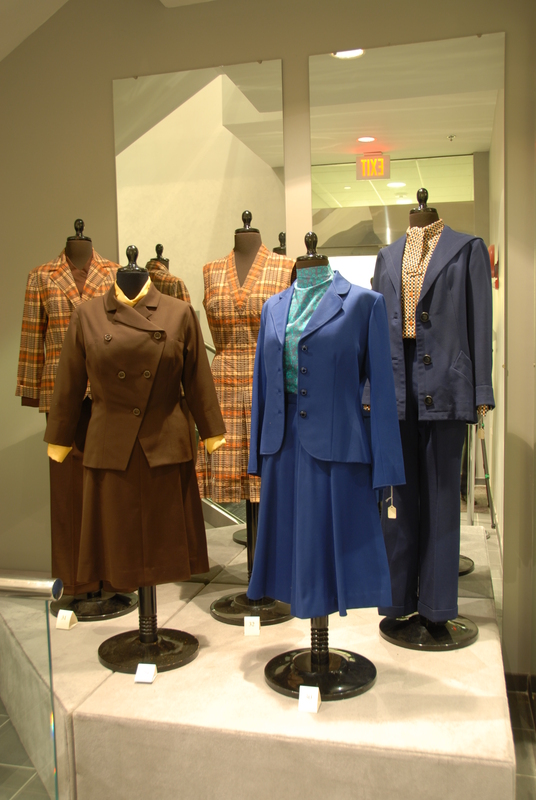 Also featured in the exhibition is the wardrobe of Dr. Joyce Smith, professor emeritus in the College of Education and Human Ecology. As a State Extension Specialist for Clothing, Joyce authored a number of training manuals and teaching aids, and traveled to County Extension Offices, 4-H clubs, high schools, colleges, and universities educating girls and women in clothing selection and construction and introducing them to personal style and couture fashion. She constructed her own wardrobe specifically to demonstrate techniques of clothing, design, fit, and construction.